A bread machine is a useful appliance for many home cooks. 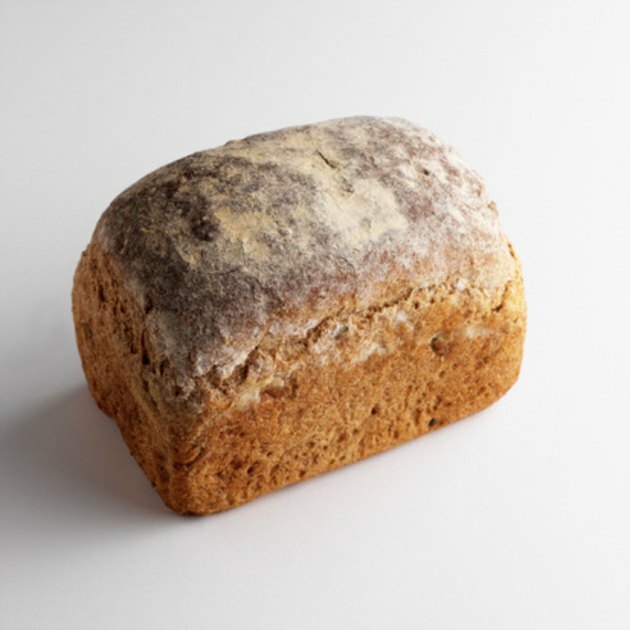 It enables someone with little cooking skill or experience to bake homemade bread using fresh ingredients. One of the problems encountered with bread machines is that the bread sometimes sticks to the inside of the bread loaf pan, even though most pans are covered with a non-stick coating. The most common reasons for bread sticking are dough that is too dry or moist, bread baking onto the upper lip of the loaf pan or a bread paddle that doesn't release properly from its housing. Sometimes a loaf of bread gets stuck in a bread machine. Cover a cutting board with a dish towel. Unplug the bread machine and remove the loaf pan from the machine. Allow the pan to rest until it's cool enough to handle comfortably. Place the loaf pan on top of the dish towel. Insert the knife blade between the edge of the bread loaf and the inside edge of the loaf pan. Slide the knife down toward the bottom of the loaf pan using a gentle rocking motion, taking care not to scratch the sides or bottom of the loaf pan. Move the knife around the inside perimeter of the pan until all sides of the loaf have been loosened. Turn the loaf pan upside-down on top of the dish towel and tap the bottom of the pan. The loaf should come out easily. Cover the top of the bread pan with plastic wrap. Turn the loaf pan over and place it on the dish towel for approximately 10 minutes. Condensation will build up inside and loosen the loaf from the pan. Shake the pan gently to dislodge the loaf. Cut as much of the loaf as possible out of the pan if it doesn't come out of the pan using either the knife or covering the loaf with plastic wrap and turning it upside-down. Use a spoon to remove as much bread as possible from the bottom and sides of the loaf pan. Dig out any bread stuck around the bread paddle and remove it. Fill the pan with warm water and allow to soak for 10 minutes before washing as normal. Colleen De Koning is a certified professional herbalist and nutritionist, a consultant for organic gardening and pond design, and has been published in books, magazines, journals, newspapers, cookbooks and on various websites. She volunteers in local community gardening projects, animal rescue organizations, and has contributed to several vegetarian cookbooks.